Southern California Edison is retiring the San Onofre nuclear power plant. The plant has not operated since January 2012, when a radioactive leak was discovered in one of its generators. The permanent closure could put pressure on California's electrical grid in the long-term. The California Independent System Operator, which manages the grid, does not expect statewide problems with power supply, though there could be impacts in Southern California as people crank up their air conditioners this summer. “From an overall state, perspective I’m not concerned about energy, other than the local pocket in San Diego and south of Los Angeles,” said Steve Berberich of the California Independent System Operator, the entity that balances the state’s electric grid. State energy regulators were already planning for the summer without the nuclear plant’s 2,000 megawatts of power. Several transmission corridors were improved so more electricity could be imported into the area and a handful of new power plants are expected to come online. Southern California’s power supplies were already constrained, as several large natural gas plants on the coast are being retrofitted or replaced. The plants use hundreds of millions of gallons of seawater for cooling, a technology that’s being phased out. With those changes in mind, the California Public Utilities Commission approved a long-term energy plan for Southern California Edison earlier this year. The utility will add 1,400-to-1,800 megawatts of power by 2021, with the majority coming from new natural gas plants. The California Public Utilities Commission is reviewing how Southern California Edison customers could be hit with the costs associated with the San Onofre plant, including maintenance and cost of replacing its power. Decommissioning the nuclear plant could also cost billions, a price tag that’s generally covered by a trust fund. “Each of the nuclear plants has a decommissioning trust fund so over time they’re paying into that fund,” says Edward Randolph, energy division director at the California Public Utilities Commission. 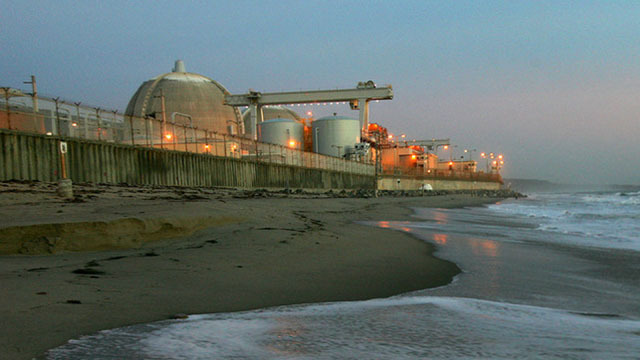 San Onofre is one of two nuclear power plants in the state. The other is PG&E's Diablo Canyon power plant near San Luis Obispo. Activists praise San Onofre closure, but 1,100 layoffs expectedAnti-nuclear activists and Sen. Barbara Boxer celebrated Southern California Edison's announcement Friday that the troubled San Onofre nuclear plant will be permanently retired. The coastal plant near San Clemente once supplied power to about 1.4 million homes in Southern California but has been shuttered since January 2012 when a tube in its newly replaced steam generators leaked a small amount of radioactive steam, leading to the discovery that the tubes were wearing down at an unusual rate.